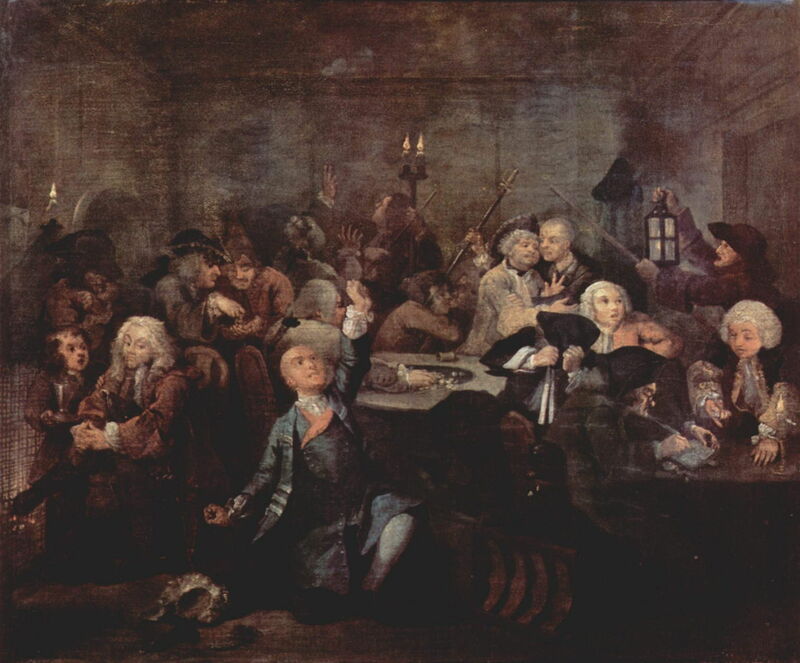 William Hogarth (1697–1764), A Rake's Progress: The Tavern Scene (1732-5), oil on canvas, 62.5 × 75 cm, Sir John Soane's Museum, London. Wikimedia Commons. One solution to the problem of paintings being a singular medium for narrative, and not a serial medium like text, is to paint a formal series of works, which are then viewed in a particular order. This happened quite commonly with polyptychs, which often showed a series of scenes through the life of Christ, for example. As these were well-known narratives, such series were not particularly adventurous or novel in technique. 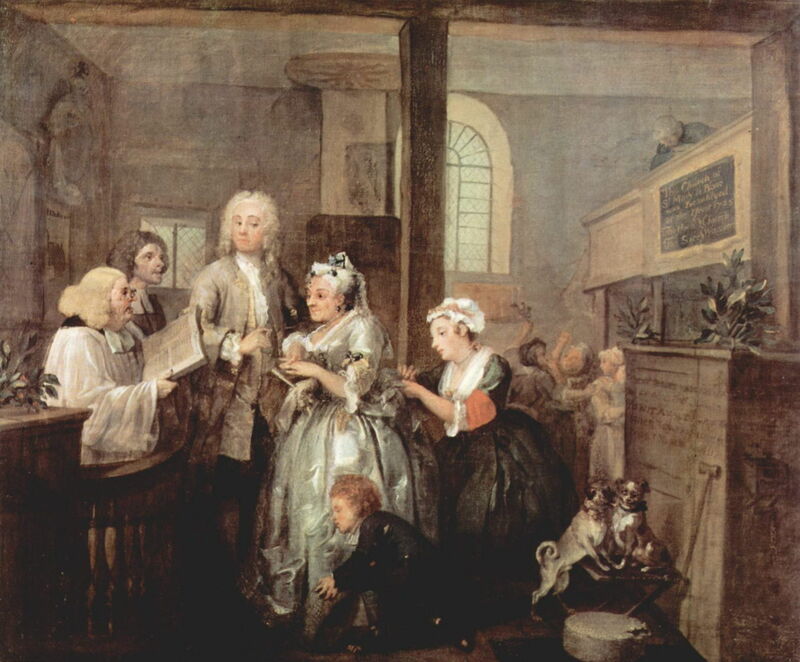 One prolific painter of narrative series, though, stands out: William Hogarth (1697–1764), who from about 1731 until 1754 painted a succession of moralising series, and his influence led several later British painters to create their own. Hogarth was a largely self-taught painter, having entered the world of art as a copperplate engraver in 1720. His works in oil were usually strongly narrative, showing moments of climax and sometimes peripeteia in theatrical productions or everyday life in London. Many included social commentary, wit, and some overtly caricatured society. One of his reasons for painting was to provide a supply of original images for engraving, and all his series paintings were seen (from a commercial view, at least) as a means to producing lucrative series of prints. In this article, I will examine his first two series, A Harlot’s Progress (c 1731), and its compliment, A Rake’s Progress (1732-5). The next article will examine his most famous Marriage A-la-Mode (c 1743), and the more unusual Four Times of the Day (1736). The article after that will consider those inspired by his series to tackle their own, including Augustus Leopold Egg (1816–1863) and William Powell Frith (1819-1909) in particular. a narrative painting, and series of narrative paintings, are by the artist’s intent to stand alone from any oral or written version of the narrative, possibly with the support of the painting’s title and a short excerpt of text; an illustration is intended by the artist to accompany a text version of the narrative; both can equally be works of art (cf. William Blake and many others). 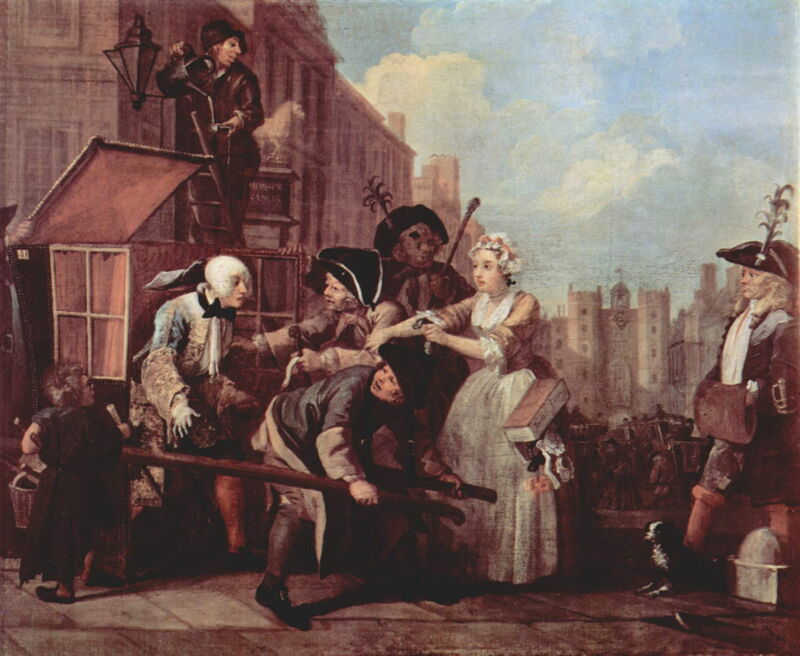 Hogarth’s series of paintings were clearly never intended to accompany text narrative. Indeed, at the time of their production, there was no text version of their narrative available – another unusual feature, as each tells a story which is new to the viewer. The six paintings from which this series is comprised were completed in 1731, and first appeared in engravings in 1732. 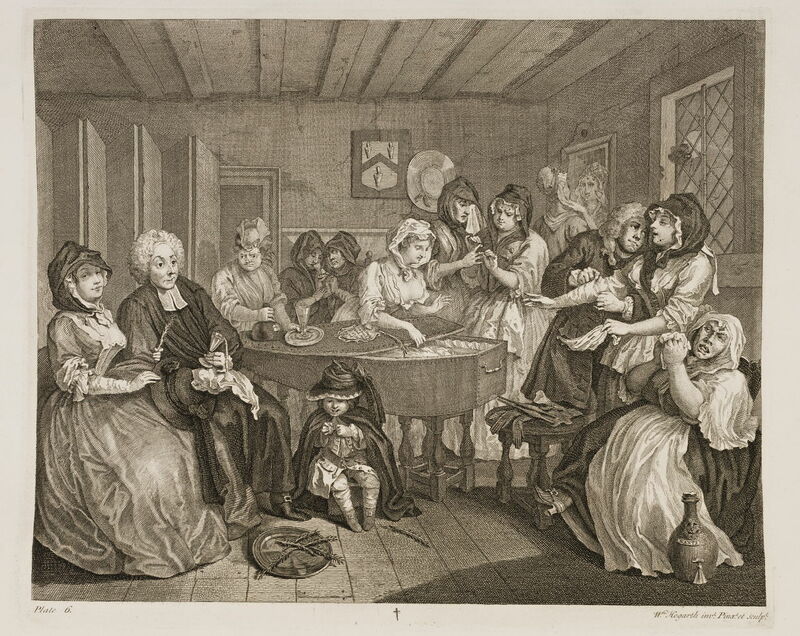 Tragically all the paintings were destroyed by fire when at Fonthill House in 1755, so we only have prints from which to study Hogarth’s first serially painted narrative. The general outline of the story is of an innocent country girl, Moll Hackabout, who comes to London, and immediately falls into the hands of a notorious brothel-keeper and madame. Moll becomes the kept mistress of a wealthy merchant, but later slides into common prostitution. She is arrested, and ends up in London’s Bridewell Prison. Having contracted syphilis earlier, the disease progresses, steadily killing her. She finally dies at the age of 23, mourned only by her fellow prostitutes. William Hogarth (1697–1764), A Harlot’s Progress: 1 Ensnared by a Procuress (engraving 1732 after painting c 1731), engraving, 30.8 x 38.1 cm, British Museum, London. Wikimedia Commons. Moll Hackabout is first shown arriving at the Bell Inn, Cheapside. Her clothing, with a fine bonnet, white dress, and flower adornments, shows her to be an innocent country girl, but she is here being inspected by Elizabeth Needham, the notorious brothel-keeper and madame. Hogarth gives the latter black skin lesions intended to signal that she has longstanding sexually-transmitted disease (syphilis), and her face is aged. Hogarth tends to use caricature appearances rather than facial expressions. In the doorway at the right is an equally notorious rake, Colonel Francis Charteris, and his pimp John Gourlay, who are also taking an interest in the arrival of a fresh young innocent. In Moll’s luggage is a symbolic dead goose, which suggests her death as a result of gullibility. The address on a label attached to the dead goose reads “My lofing cosen in Tems Stret in London”, suggesting that Moll’s move to London has been arranged through intermediaries, who may well have profited from her being trafficked into the hands of Elizabeth Needham. Behind Moll, an itinerant preacher is engrossed in spreading the message to his small ad hoc congregation in the back of a covered wagon. In front of that a pile of pots is just about to collapse, as is Moll’s life. In each engraving – and even more so in the original paintings – Hogarth packs in an abundance of cue, clues, and symbols to support the narrative. 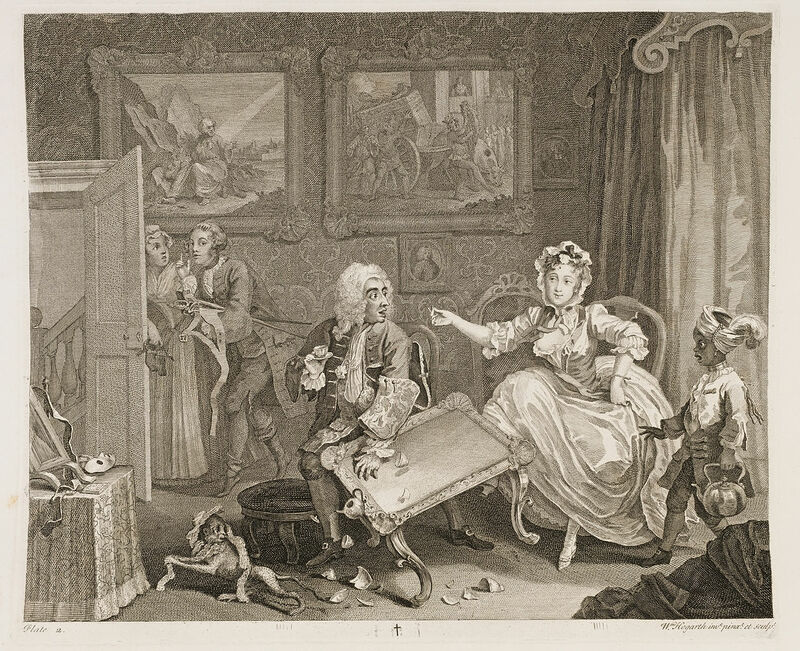 William Hogarth (1697–1764), A Harlot’s Progress: 2 Quarrels with her Jew Protector (engraving 1732 after painting c 1731), engraving, 31 x 38 cm, British Museum, London. Wikimedia Commons. Hogarth next shows us Moll at the top of the slippery slope to perdition, as the kept woman or mistress of a wealthy Jewish merchant; sadly anti-semitism was endemic at the time. The cues to this are abundant, in Old Testament paintings on the wall, which also seem to prophesy Moll’s fate at his hands. Enjoying relative luxury at this stage, she has a black serving boy and a monkey. On a dressing table at the far left is a mask, for masquerade balls, and Moll has just deliberately knocked the table over to distract her merchant’s attention, whilst in the background another lover is able to tiptoe out. 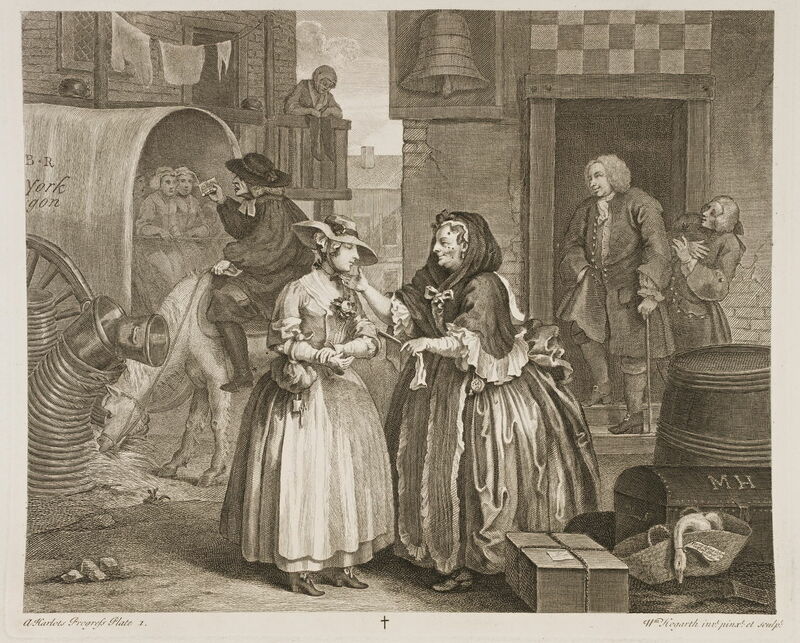 William Hogarth (1697–1764), A Harlot’s Progress: 3 Apprehended by a Magistrate (engraving 1732 after painting c 1731), engraving, 31 x 38 cm, British Museum, London. Wikimedia Commons. Moll’s descent continues as she is here nothing but a common prostitute, her bed being the only substantial piece of furniture in the room. Her maid is already floridly syphilitic, with black pox marks on her face and a sunken bridge to her nose. She keeps a cat, who is posed in the manner of her mistress when at work. She is surrounded by symbols of her evil, such as the black witches hat and broomstick, and above the bed is a wigbox belonging to a highwayman who was hanged on 11 May 1730. At the right, in the background, Sir John Gonson, a famous magistrate, is entering with three armed bailiffs to make her arrest. Meanwhile she is showing off a new and expensive pocket watch. 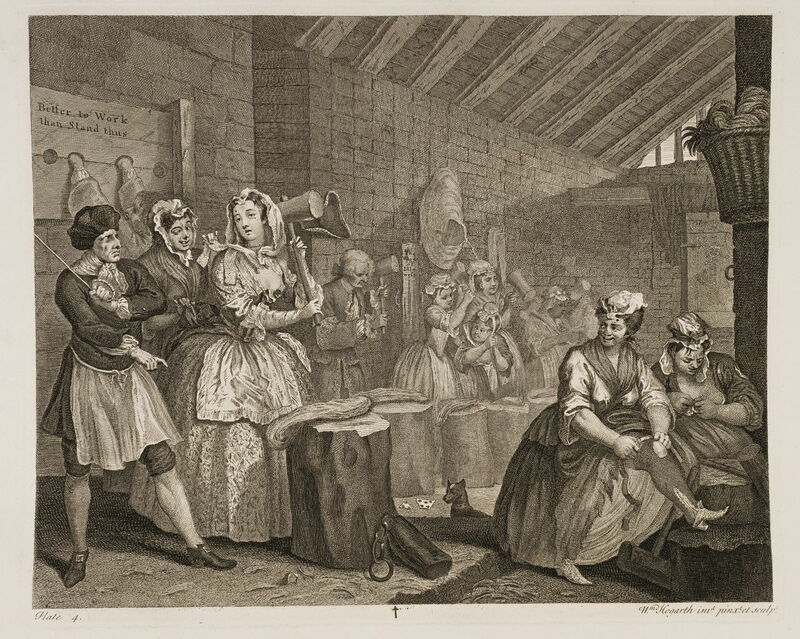 William Hogarth (1697–1764), A Harlot’s Progress: 4 Scene in Bridewell (engraving 1732 after painting c 1731), engraving, 31.1 x 38.3 cm, British Museum, London. Wikimedia Commons. Moll ends up in Bridewell Prison, beating hemp to make nooses for hanging. Her jailer, at the extreme left, beats her to make her work harder, while his wife is stealing the clothes off her back. To the right of Moll is a card-sharp who is accompanied by his dog, and possibly the rest of his family. In the background is a black woman who appears pregnant, who could therefore not be executed or transported. In the foreground, at the right, is Moll’s maid, showing off a pair of Moll’s shoes. Moll herself now has growing black spots on her face, indicating the progress of her own syphilis. 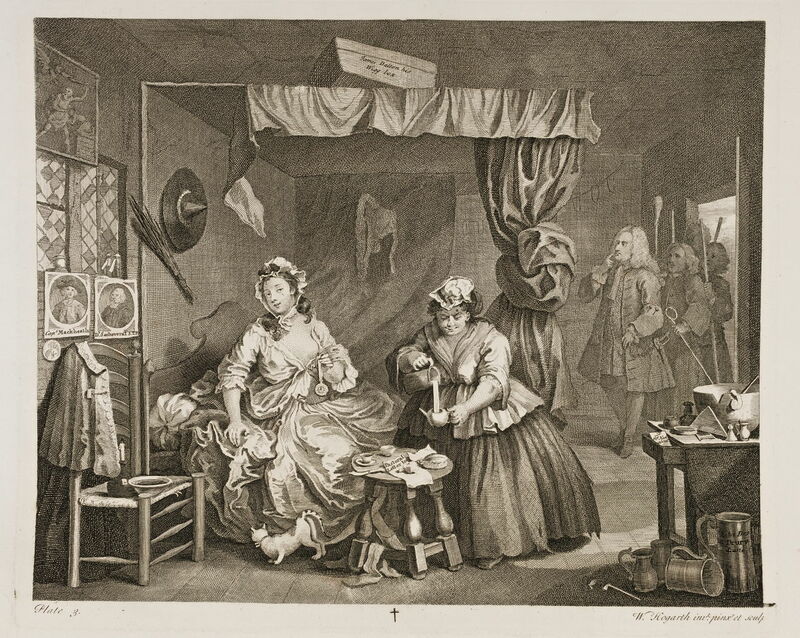 William Hogarth (1697–1764), A Harlot’s Progress: 5 Expires while the Doctors are Disputing (engraving 1732 after painting c 1731), engraving, 31.3 x 38.2 cm, British Museum, London. Wikimedia Commons. With Moll in the final throes of her syphilis, she is attended by Dr. Richard Rock (dark hair) and Dr. Jean Misaubin (white hair), who are arguing over the best treatment. 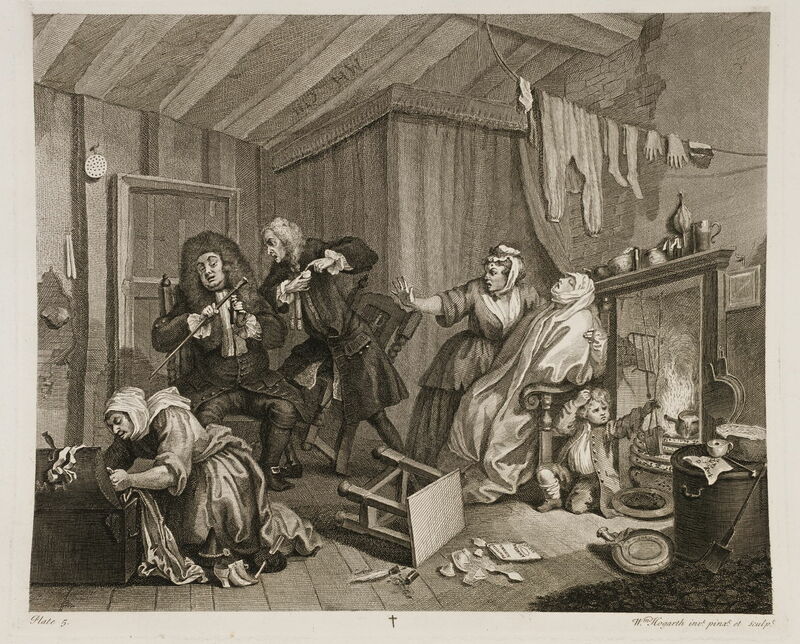 Another woman, possibly her landlady, is rifling Moll’s possessions, while Moll’s young son sits close to the fire. A Passover cake is hung by the door as a flytrap, suggesting that her former lover (the Jewish merchant) may be supporting her in her dying days. William Hogarth (1697–1764), A Harlot’s Progress: 6 The Funeral (engraving 1732 after painting c 1731), engraving, 31.3 x 38.2 cm, British Museum, London. Wikimedia Commons. Moll finally dies at the age of 23, on 2 September 1731, and her wake is attended mainly by fellow prostitutes. A parson sits, drunkenly fondling the woman next to him, and spilling his brandy (a sexually explicit symbol). Most of the women bear the hallmarks of syphilis, and Moll’s orphaned son sits innocently playing under her coffin. Various other visual cues and clues are given in Hogarth’s elaborate details. 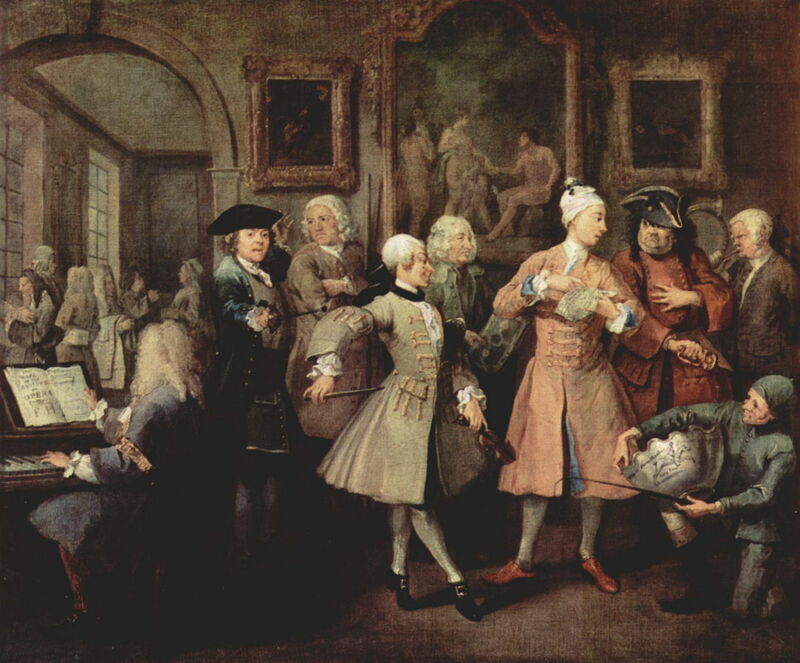 No sooner were the prints being made of A Harlot’s Progress than Hogarth was at work with its successor, eight paintings showing the similar downfall of a man. His outline is again quite simple and strongly moral: Tom Rakewell inherits a fortune on the death of his miserly father. Tom then squanders his money making himself appear grander, engaging in expensive pursuits, and in orgiastic nights in brothels. Pursued by bailiffs, he narrowly escapes arrest when on his way in a sedan chair to a party at St James’s Palace. He then has to marry a rich but ugly old woman for her money to settle his debts. But his descent continues with large losses gambling, and he is put into the Fleet debtor’s prison. There he becomes insane, and ends his days in Bethlehem Hospital (‘Bedlam’). These are shown in Hogarth’s original oil paintings, now on display in Sir John Soane’s Museum, London, and in the prints derived from them. 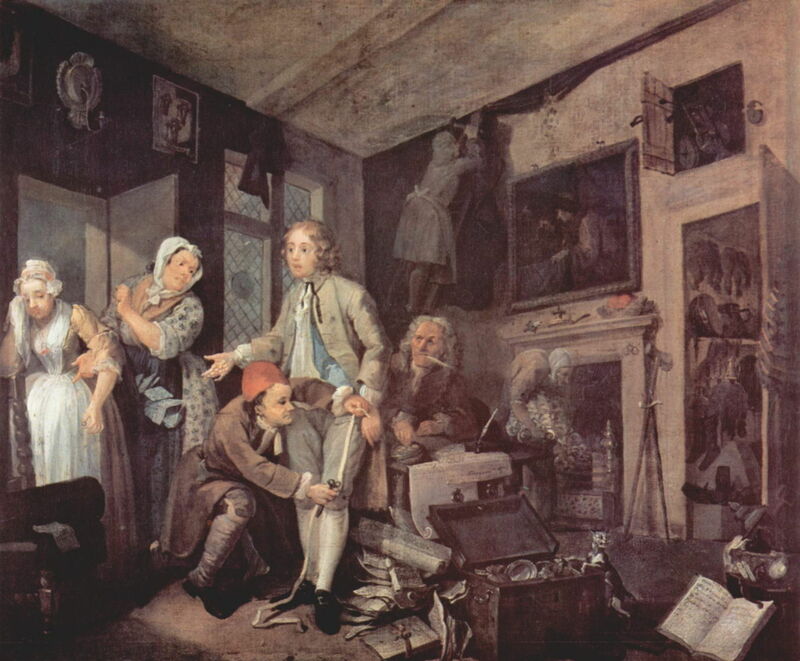 William Hogarth (1697–1764), A Rake’s Progress: The Young Heir Takes Possession of the Miser’s Effects (1732-5), oil on canvas, 62.5 × 75 cm, Sir John Soane’s Museum, London. Wikimedia Commons. Tom Rakewell has inherited a fortune from his father. The latter is portrayed as being extremely miserly by the house full of symbols of meanness, such as a half-starved cat, resoled shoes from the cover of a bible, etc. While he is being measured for new clothes by his tailor, Tom rejects his pregnant fiancée Sarah Young, who is crying at the left edge of the painting, her mother comforting her and remonstrating with Tom. William Hogarth (1697–1764), A Rake’s Progress: Surrounded by Artists and Professors (1732-5), oil on canvas, 62.5 × 75 cm, Sir John Soane’s Museum, London. Wikimedia Commons. Tom sets out to make a new man of himself with the aid of many tutors and hangers-on. The composer Handel plays at the harpsichord, then there is a fencing master, a quarterstaff instructor, a dancing master with violin, Charles Bridgeman (a famous landscape gardener), Tom himself, an ex-soldier acting as bodyguard, a bugler from a foxhunt, and a jockey. In the background are others who are busy spending Tom’s inheritance on worthy causes no doubt. William Hogarth (1697–1764), A Rake’s Progress: The Tavern Scene (1732-5), oil on canvas, 62.5 × 75 cm, Sir John Soane’s Museum, London. Wikimedia Commons. At night, Tom spends more of his money in the Rose Tavern, a well-known brothel in Covent Garden, London. 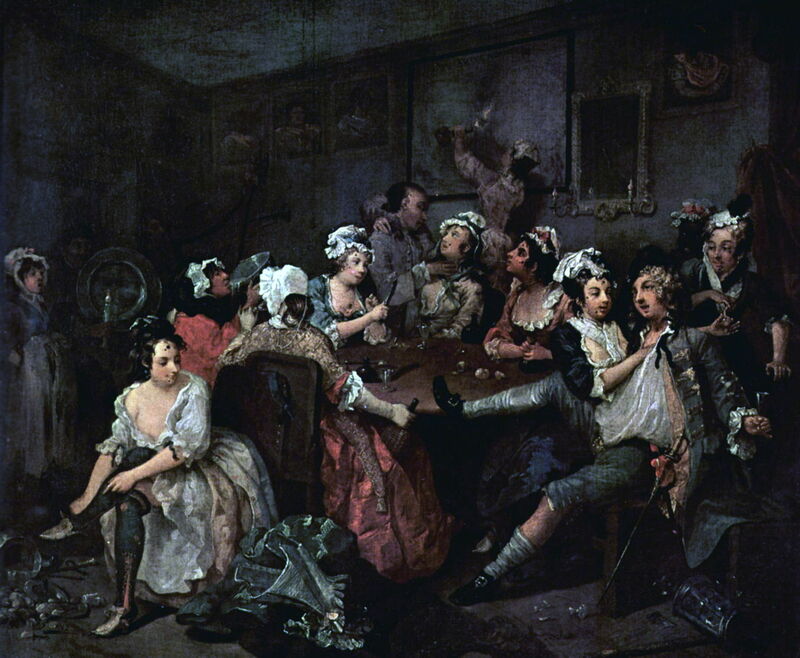 The prostitutes – and there are seven pictured and paid-for – bear Hogarth’s usual black pox marks to indicate their state of ill-health and occupation. William Hogarth (1697–1764), A Rake’s Progress: Arrested for Debt (1732-5), oil on canvas, 62.5 × 75 cm, Sir John Soane’s Museum, London. Wikimedia Commons. With his inheritance vanishing, Tom’s debts start to mount. Seen being carried in a sedan chair to St James’s Palace, Welsh bailiffs (with leeks on their hats) attempt to arrest him for debt. As it is St David’s Day (1 March), he can only be going to the palace to celebrate Queen Caroline’s birthday. Thankfully, his former fiancée Sarah Young, now a milliner, intervenes and saves his day. In a symbolic twist, a worker who is filling an oil street lantern behind and above Tom anoints him accidentally with oil, marking the ‘blessing’ by Sarah. A young thief is just making off with Tom’s silver-handled cane, though. William Hogarth (1697–1764), A Rake’s Progress: Married To An Old Maid (1732-5), oil on canvas, 62.5 × 75 cm, Sir John Soane’s Museum, London. Wikimedia Commons. Tom’s only recourse is to marry money, in the shape of an ugly old spinster, which he does in St Marylebone. As Tom undergoes the wedding vows, he is already looking towards his new wife’s maid, who is younger and prettier. In the background, Sarah Young has arrived, holding her young child. Sarah’s mother is seen in a disagreement with one of the wedding guests. The two dogs and other details at the right provide further cues and clues to additional narrative. Despite this influx of his new wife’s money, Tom’s descent continues unabated. Here he is in a gambling den, surrounded by London’s low-life, on bended knee, pleading to the Almighty for one last chance to recover his money. 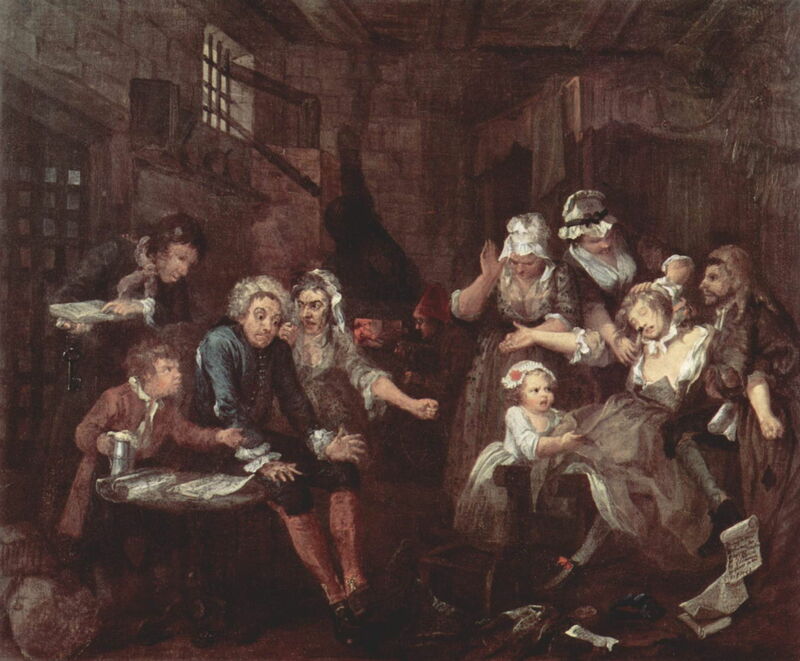 William Hogarth (1697–1764), A Rake’s Progress: The Prison Scene (1732-5), oil on canvas, 62.5 × 75 cm, Sir John Soane’s Museum, London. Wikimedia Commons. Tom’s debts finally catch up with him, and he is thrown into the infamous Fleet debtors prison. He is surrounded by those demanding money from him, but is unable to do anything. Beside him is a rejected attempt to raise money by writing a play. In the background are signs of developing madness: an alchemy experiment, presumably to try to turn base metal into gold, and equipment for studying the stars, in the hope that they may signal a change in fortune. Here Hogarth uses a rich range of facial expressions, together with body language, to heighten the sense of drama and welling crisis. William Hogarth (1697–1764), A Rake’s Progress: The Madhouse (1732-5), oil on canvas, 62.5 × 75 cm, Sir John Soane’s Museum, London. Wikimedia Commons. Tom’s crisis resolves into madness and violence, so he is taken to spend the rest of his days in London’s Bethlehem Hospital, whose common name of Bedlam has entered the English language. Tom is almost naked, tensed and stressed on the floor, with only Sarah Young to comfort him. Again he ignores her. 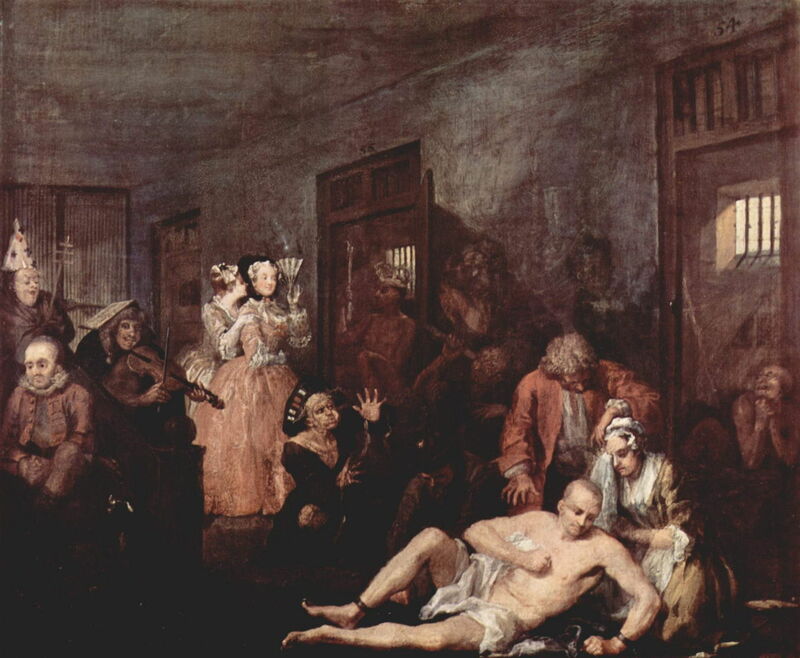 Other inmates show the disturbing signs of their conditions, and two well-dressed ladies have come to watch the antics of those in Bedlam, as a social event. Posted in General, Painting and tagged Harlot's Progress, Hogarth, narrative, painting, Rake's Progress, series. Bookmark the permalink.